Reaching youth and adult learners with little or no experience using technology in developing countries | Clarity Innovations, Inc.
A simple, practical, and straightforward curriculum for introducing digital literacy to a global population of diverse needs. While adapting the curriculum into PDF and EPUB formats, we recognized several opportunities for improving the content of the curriculum to make it more approachable and usable for a variety of audiences. The client agreed and hired us to refresh the entire curriculum used worldwide. The curriculum was designed to teach basic computing, office productivity applications, and Internet use to youth and adult learners with little or no experience using technology, primarily living in developing countries. The client wanted to refresh the curriculum so that it focused on job-readiness skills as well as basic technology use. They also wanted the curriculum to have a “core” set of modules and a set of optional lessons and activities for trainers for a trainer to select the most useful modules for their audience. Clarity reviewed the existing curriculum materials and reorganized the content into a more modular and flexible format. Clarity also created content to support the revised curriculum, including new modules, lessons, and activities. Along with new content, the Clarity team created new images, graphics, and other digital assets to better represent the curriculum and improve its appearance and usability. 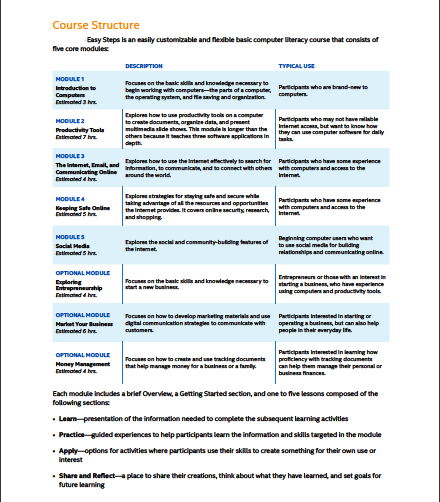 Clarity created and delivered the updated curriculum in print and digital versions (PDF and EPUB) and delivered a facilitation guide to help trainers deliver the curriculum as a face-to-face course. With these changes and updates to the format, youth and adult learners are improving their basic digital literacy skills and enhancing their opportunities for social engagement and economic self-sufficiency.